Easily improve your website to better serve your business goals. If it has fallen victim to one of the 5 Deadly Mistakes discussed in Home Sweet Home Page, it most definitely is! Each day ... no, minute ... that you have an ineffective website representing your talent, you are losing business, losing opportunities and losing the chance to make a difference in this world. And the kicker is, most of the time, it would take just a few simple changes to your home page to turn all this all around! Yes, simple, easy-to-do, tweaks to your home page can improve your website’s success. 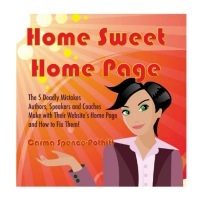 And you’ll learn what they are in Home Sweet Home Page: The 5 Deadly Mistakes Authors, Speakers and Coaches Make with Their Website’s Home Page and How to Fix Them! This little book is packed with useful, easy-to-understand information that you can apply to your website before the week is out! * The 5 basic types of website and what purpose each serves. * How your domain name can make or break your business, reputation and perceived expertise. * Why an opt-in box is important and where you should place it on the home page. * The basics you need to know about opt-in incentives. * A simple technique you can use to optimize information on your home page for better search engine results. And so much more ... including the 6 questions you simply must to answer with your website if you want it to be an effective marketing tool. For more than 20 years, Carma Spence-Pothitt has used her writing talent to help people understand something new to them, taking dry facts to common knowledge to scientific research and making it sparkle with life. She pours her heart into her work, believing everyone has a gift for the world.